SRA Home Products is pleased to make various styles of outdoor rooms available to Wilmington, Delaware, homeowners. If you’re looking to have an addition installed, don’t settle for a one-size-fits-all model that doesn’t blend into the rest of your home. Consider our many distinctive styles and pick one that will best match your home’s architecture. California — The California style is characterized by its unique split-level design. Because it has a taller back wall, it’s ideal for two-story homes. Cathedral — The cathedral style features elegant vaulted ceilings. It’s available in three configurations: factory cathedral, low cathedral, and custom cathedral. Conservatory — The conservatory style is characterized by its glass roof. It’s available in faceted Victorian and square Edwardian frameworks. Santa Fe — The Santa Fe style includes pergola trim along the edges of its roof, achieving a graceful Mediterranean look. 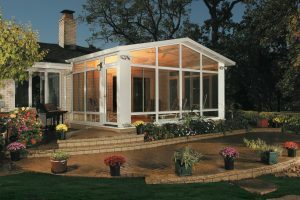 Solarium — Like the conservatory model, the solarium style features a thermal glass roof. On our solarium-style outdoor rooms, however, the roof slopes down from the side of your home. Studio — The studio style can be adapted to fit one- and two-story homes, plus one-, two-, three-, and return-wall configurations. It’s this incredible versatility that makes it our most popular model. We also offer outdoor rooms from the Nino Vitale Signature Collection, named for our manufacturer’s founder and CEO, which come with even more customization options, such as brickwork and siding to match your home. For more information about how you can customize one of our magnificent outdoor rooms to match your Wilmington, DE, home, please contact SRA Home Products today.